Taco Catering North Platte: Have You Tasted Our Knockout Tacos? 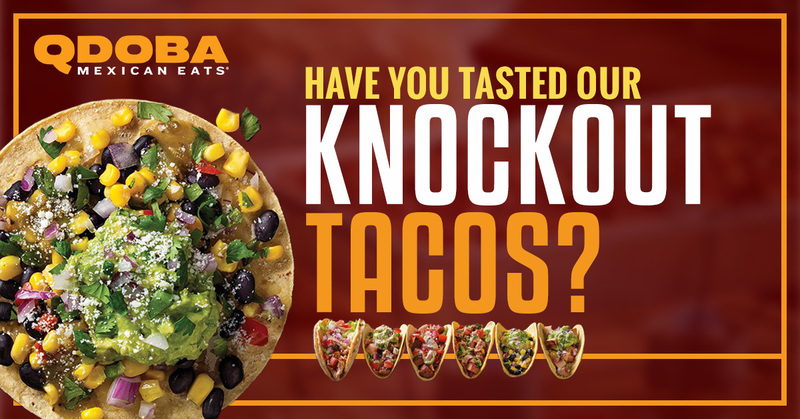 Have You Tasted Our Knockout Tacos? The reviews are in: Qdoba Knockout Tacos will have your taste buds floating like a butterfly! Try them all and see which one knocks you out! Don’t forget that we offer a Hot Taco Bar for your taco catering needs! We know that when you are craving Mexican food, you think of Qdoba Mexican Eats, and now you can get that delicious goodness that is Qdoba as catered meals for your next family get-together or business meeting. Our latest release is a set of six tacos, with fresh, savory, and innovative combinations that will wow your tastebuds. When we went to make new flavor combinations, we decided to let our tastebuds be our guides. What flavors work best together, regardless of how new and innovative they might be? Yes, bacon in a taco. Does life get any better than this? If you are a bacon lover, try the Triple Treat, Mad Rancher, and Gladiator Tacos. Try the Drunken Yardbird to sample our juicy, scrumptious tequila lime chicken. The tangy flavor mixed with the salsa verde will take you to the mat for the full ten count of enjoyment! The creamy cotija cheese and cilantro will revive you just in time to take another bite! We never forget our vegetarian friends when we are thinking up new twists, and this time is no exception. The Bohemian Veg features shredded cheese, healthy and savory black beans, corn salsa, hand-smashed guacamole, salsa verde, and minced onions. It’s truly a filling and satisfying meal! If you need tacos brought to your next family gathering or office party, order our Hot Taco bar. Try all six Knockout Tacos to find out which one is your favorite, or order the Hot Taco Bar for your next catered event. You get the choice of marinated grilled steak, marinated grilled chicken, and a full complement of the trimmings, including three salsas and hand-smashed guacamole. Order your catered Hot Taco Bar or stop in and try a Knockout Taco in North Platte!